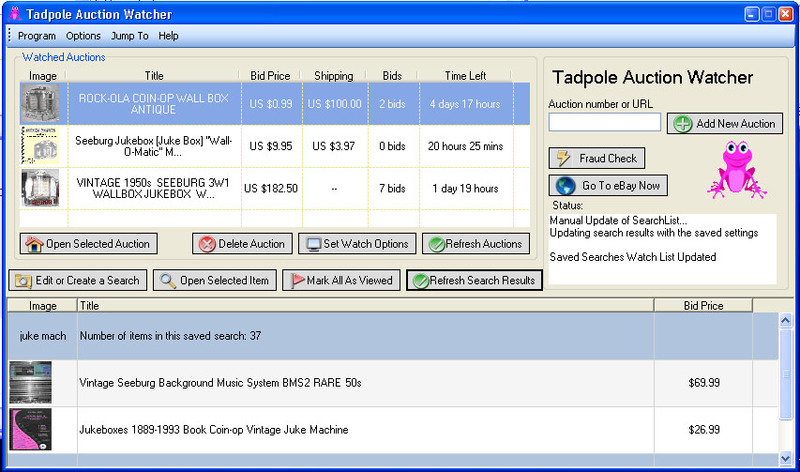 Tadpole Auction Watcher allows you to watch selected auctions and receive alerts when there is a bid change or when the auction is near ending. You can also setup searches to automatically show the result when items you are interested in appear. See which items are newly listed in a category throughout the day and find items by keyword without visiting eBay several times during the day to find items you want. Watcher software for audio/video surveillance, broadcasting and more. AuctionSleuth helps you find auction buys and spend little time monitoring them. WebMasters watch LIVE hits on your web site with WebWatcher. Qweas is providing links to Tadpole Auction Watcher 1.0.3 as a courtesy, and makes no representations regarding Tadpole Auction Watcher or any other applications or any information related thereto. Any questions, complaints or claims regarding this application Tadpole Auction Watcher 1.0.3 must be directed to the appropriate software vendor. You may click the publisher link of Tadpole Auction Watcher on the top of this page to get more details about the vendor.